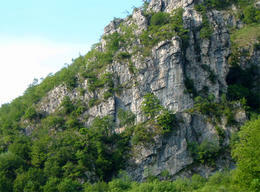 This vast cliff, which has several adjacent sectors, was discovered and equipped by Paolo Vitali and Sonja Brambati, with a great job, and is located just upstream of the village of Ballabio, in Valsassiana. Climbing takes place on vertical or overhanging walls, and is often physical and resistant. There are a hundred string shots, of medium to high difficulty. Most of the difficult pitches, except where not specified, were freed by Paul Avenue. For its convenience this site is very popular in every season, also thanks to the excellent fix equipment. In the Alpine Heart sector the rock dries very slowly. In summer the place is usually too hot except for the basal belt in the forest. We thank the portal: http://larioclimb.paolo-sonja.net/falesie_lecco/torrette/ - Lario Climb source of a part of the material. The portal of Paolo Vitali and Sonia Brambati hosts many other Lecchese cliffs and updates. Access: Reaching the village of Ballabio. For those coming from Lezzo just before the roundabout at the end of the straight, turn right into "Via Valderia" at a restaurant called "Ca 'Formai". You park on the right almost at the end of the small road. From there continue on foot uphill along the path n.34 up to the first bend on the right. From here it cuts to the left in the woods reaching the sector "Prmo Piano" placed on the first level. Follow it to the left to go up a path to the entrance of a ledge that goes right under the "Second Floor", with fixed ropes and starting stops. Continuing uphill you reach instead the terrace of the "Terzo Piano" sector, from which towards the right (along a short exposed stretch with a chain) you enter a gravelly canal. You go down a few meters to take the ramp that leads to "Trappol Music". For the "Cuore Alpino" sector, on the other hand, continue along the main path just after the hairpin bend, then go up a steep trail in the woods on the left. Approximately 10 minutes. Exposure: Recommended for middle seasons. To be avoided in the warmer seasons. Gear: Excellent nailing made with fix. They have bolted: Paolo Vitali and Sonja Brambati. Rock: These are movements in slight overhang or on small pronounced roofs. For the very small notches it takes good strength and speed.